B & H Engineering, P.C. 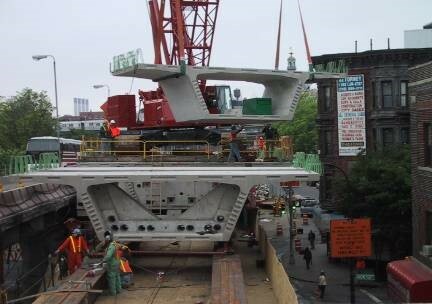 has provided construction inspection services, as a prime consultant, to the New York State Department of Transportation for Replacement of Marcy Avenue Ramp to Williamsburg Bridge. The project involved removal of existing ramp structure and replacement with presstressed segmental concrete structure. Scope included erection of a temporary bridge to detour traffic, soil, new ramp on structure and on grade, concrete barriers and deck, new lighting and drainage structures, new asphalt wearing surface, installation of pavement markings, night work, and work zone traffic control.